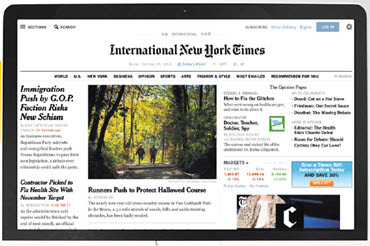 Read what’s happening right this moment around the world through the newly introduced free digital access to the New York Times provided by Wellington City Libraries. From business, politics and technology to arts, style and food – with this range, you are sure to find articles, interviews and special reports you’ll enjoy. You can also share your own thoughts by making comments in the ‘Readers Comments’ section. As a Wellington City Libraries member you can login with your card details and claim a ‘group pass’, which offers 24 hours access to the ‘New York Times’ and the ‘International New York Times’ websites via your browser or the dedicated NYT smartphone app. (NB When you first login, you will need to create a New York Times’ account). Included in the pass is access to the searchable archive from 1851-1922 and 1981-present. You’ll find information about this new access on our mygateway.info Newspapers page, or call in to see us at your favourite Wellington City Libraries’ branch if you have any queries. We will be happy to take you through how to login to the New York Times and answer your questions. Happy reading!